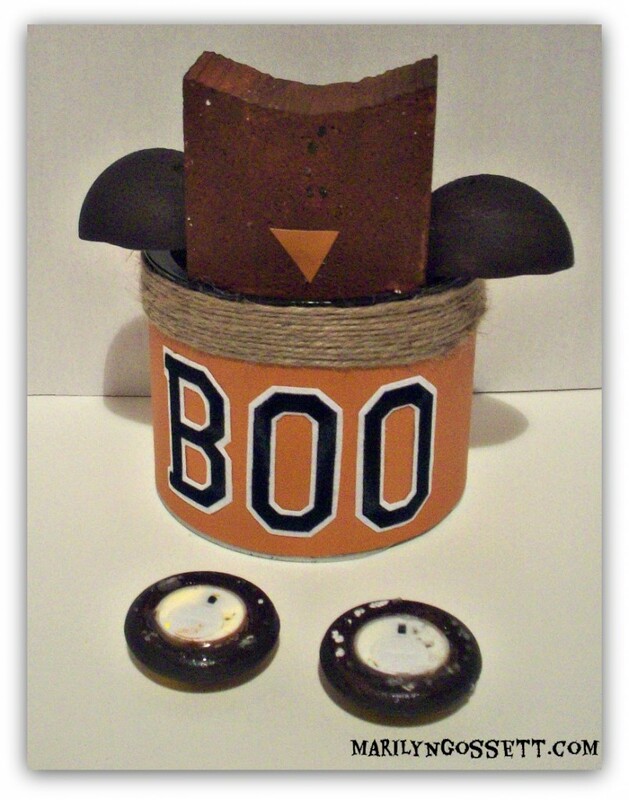 This Halloween owl decoration will light up any fall celebration! His eyes are made with tea lites and Smoothfoam mini wreaths. 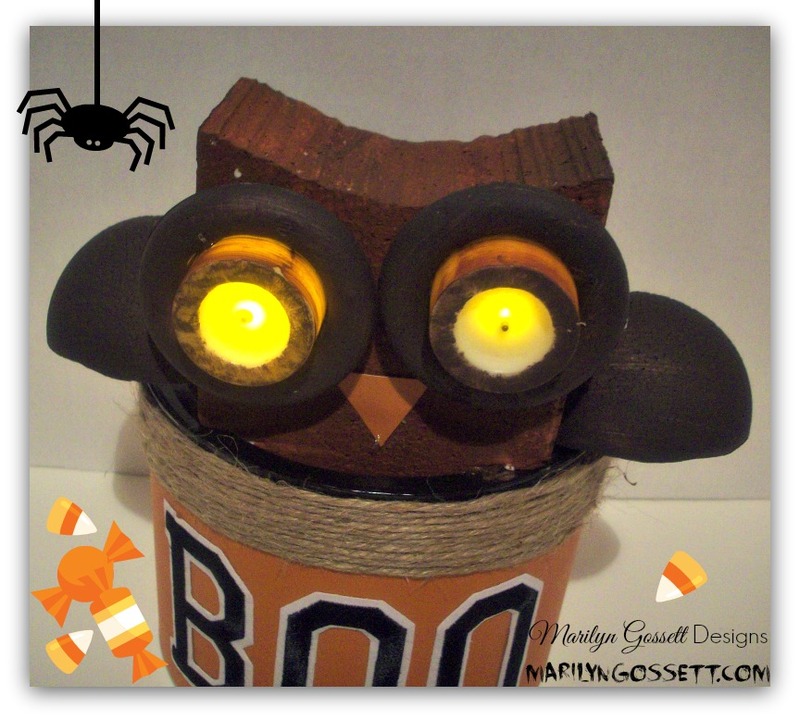 This DIY light-up owl is a little spooky and a lot of cute, so let me tell you how to make one! For the owl’s body, cut away a rounded piece at the top of the Smoothfoam block with the hot wire tool, to create the shape of the owl’s head and ears. Make sure the block fits in the can. Cut the half-ball in half again to create two wings. Cut 1″ off one end of each wing so they can fit flush against the sides of the block body. Using a skewer for a handle, paint the block body burnt sienna and paint the wings and wreaths black. Allow to dry thoroughly. Make sure that your tea lights fit inside the Smoothfoam wreaths as shown. Paint the sides of each wreath sienna, then paint around the edges with black. Apply glue to the inside edge of one wreath and insert a tea light to make an eye for the owl. Repeat for the other eye. ** Important: Apply the glue to the back of each wreath, but do not get it on the tea light. 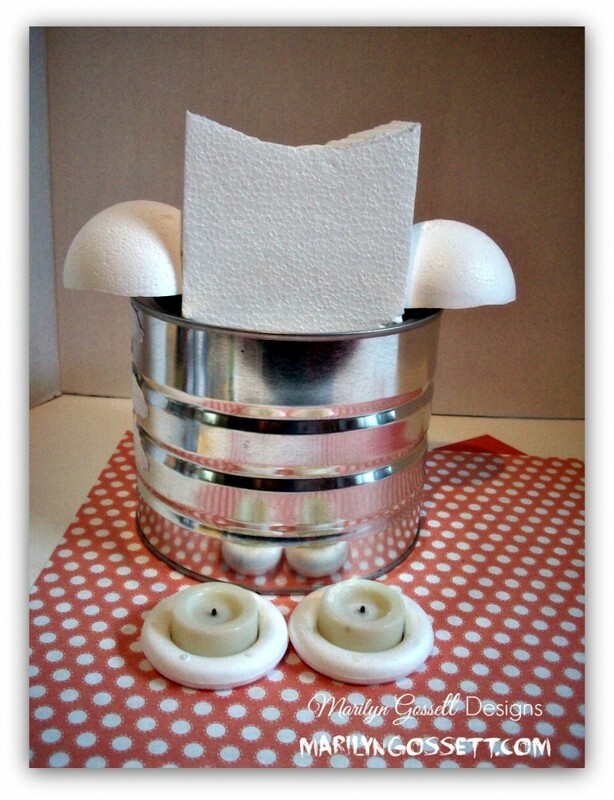 Allow the glue to dry thoroughly before touching it again, so that you’ll be able to remove and replace the tea lights to turn them on and off. Measure and cut the orange cardstock to fit around the can and glue in place. Wrap and glue the jute string around the top of the can as shown. Glue the embroidered letters to the front of the can. Place the block body inside the can and push up against the edge. Poke a toothpick halfway into the flat end of one wing, then push the opposite end of the toothpick into the block. Repeat for the other wing and add glue to secure. Adhere the wreaths to the top (head) of the block with adhesive tape – they should stay put well enough to keep from falling off; but still come off easily enough to allow for turning the tea lights on and off. You could try using Velcro dots as an option. Cut a triangle from a scrap of orange cardstock for the owl’s beak and glue it between the bottom edges of the eyes. Dress up your DIY light-up Halloween owl decoration with little pumpkins, candy and other Halloween embellishments and enjoy! 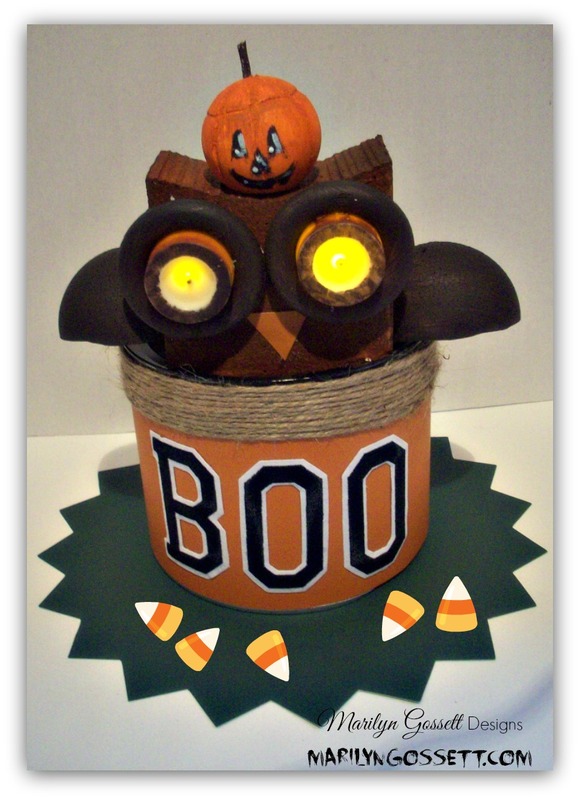 This entry was posted in Holiday Crafts and tagged Ball, Block, Brown, Halloween, Special shapes, Tabletop by Marilyn Gossett. Bookmark the permalink.